This is a feature where I interview book bloggers about their non-bookish passions. For more information, click here! Last week, I interviewed Emily about her passion for ballet. Today, I am joined by the lovely Joséphine of Dudette Reads to talk about floorball! Read onto learn what exactly floorball is, good strategies, and the life of a floorball player (injuries and all! Ouch!). I can barely hit a ball when it isn’t moving, much less keep up with the fast-paced moves in floorball! Welcome to the blog, Joséphine! Thank you for letting me interview you for Bloggers Beyond Books. As someone who can barely kick a ball, I’m really interested to hear about your love for sports. What are some of your favourites, and if you could narrow it down, what is your absolute favourite? Hey Ana! Thank you for having me! Don’t worry, I’m not so great at kicking balls either. Even though I’ve gone through a lot of sports, soccer never really became my thing. Let’s see, I’ve done quite a few and enjoyed them all. I even did cross-country and track, which were a pain at first because I didn’t like running but I was good at it, and in the end, both cross-country and track turned out to be very satisfying. Hmmm. I guess I’d have to say that my greatest love is for floorball. I joined floorball when my school was shutting down our table tennis team because I thought it’d be fun to switch to a proper team sport. Plus, my school’s floorball team was quite new, so I hoped I’d have a shot at making the competitive team. And I did! I continued to play in university, made the varsity team, and also joined a club to compete in our local league. Although, I also picked up field hockey for fun in uni. I really enjoyed it, so now that I graduated, I joined a field club as well, so I can continue playing. So, to answer your question, my absolute favourite is floorball, closely followed by field hockey. Wow, congratulations on making it to the varsity! I have to confess that I don’t really know a lot about floorball. I do have some friends who play it, but I’ve never seen them play or they’ve never explained the sport to me in detail. From what I gathered, it’s kind of like indoor field hockey? I think I’m way off the mark here, so could you please explain to us what floorball really is? Thank you! Varsity was fun but also very challenging because many of my teammates had been playing floorball much longer than me. Some of them even played it years before I knew the sport existed. You’re right to say that floorball is a type of hockey. But there are major differences. Field hockey takes place on a field that is roughly the size of a soccer pitch with 11 players (incl goal keeper) a side. A floorball rink is much smaller at 20m x 40m (65ft x 131ft). There are 6 players a side, where 5 are field players with sticks and one is a goal keeper without stick. The ball is made of plastic and has holes, so blocking shots isn’t a problem. Most of the time bruises fade after a couple of days. I would never want to be in the way of a field hockey ball. Field hockey balls are hard, and can do some very serious damage. They’re not much lighter than baseballs, you see. In terms of rules, floorball has greater similarities with ice hockey than field hockey. As with ice hockey, floorball is usually played in lines. Line changes (or substitutions) are done in lines rather than as individual players. Games consist of three periods that last 20 minutes each. I think penalties in floorball are very similar to ice hockey as well, what with serving 2 minutes in the penalty box for fouls such as pushing. Although, checking isn’t allowed in floorball. Technically only shoulder-to-shoulder contact is permitted. Thank you for the explanation, floorball makes more sense to me now. I won’t sound completely clueless next time I see my floorball-playing friends. From the video, it looks like a cluster of players around the ball makes it easy to get hurt by errant sticks or limbs. Do you have any stories of some of your most challenging experiences in floorball? I’m glad it does! But don’t worry. You’re not the only who didn’t really know what floorball was about. Strangers often stop me on the streets to ask what sport my stick is for. Many assume it’s for field hockey. Haha. And good point! Even though floorball is often listed as a minimal contact sport, I disagree. Players are often pushed into the boards, or out of the court across the boards that demarcate the rink. When I first picked up the sport, I got elbowed in the face such that my glasses flew across the court. On the bright side, my parents finally allowed me to get contact lenses after that. During one of our friendly games against this newly formed team, I was sprinting and dribbling the ball when one of the girls tried to go for a tackle and stuck her stick between my legs. She didn’t know it was against the rules and I ended up doing a somersault :O Good thing I was going that fast. Otherwise I would’ve fallen instead. Mind you, I don’t know how to somersault, so I was in shock when my coach and teammates told me I did a full flip, landing on my feet again! The worst incident for me though was during one of our minor competitions in uni which was supposed to prepare us for inter-varsity. I was cutting in towards the goal, all ready to score but the last defender had different ideas. Even though I had beaten her, she still tried to stop me. She ended up shoving me full on with her hand flat on my back. Needless to say, I was flung forward. I couldn’t break my fall and landed pretty badly on my knee. The next day I woke up in so much pain, I couldn’t move my leg. Turns out I had pulled my meniscus. The doctor predicted two weeks for recovery. It took two months. Those two months were some of my worst two months. I was so scared I wouldn’t recover in time for inter-varsity because I only had three months left to prepare. Before my injury I had been determined to work my way up to the first line. After the injury I was so frustrated because I couldn’t even train. After a month my coach relented and let my practice my stick work but I still couldn’t run. No matter how tiring and gruelling training can be, it’s even harder watching your teammates improve while you can’t do anything to get better yourself. It was less than a week to inter-varsity that I could run again but I had to grit my teeth through sprints. 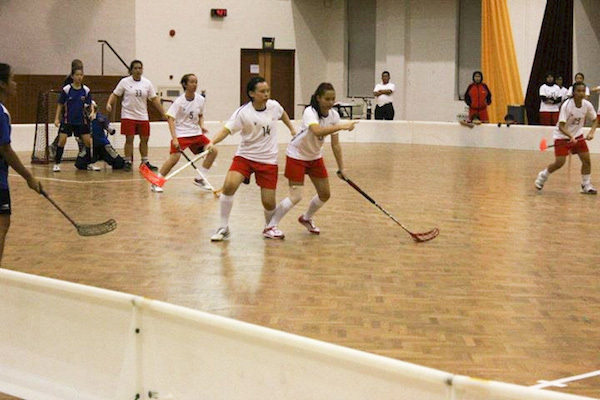 This definitely was the most challenging experience in floorball for me. Yeowch! I was wincing reading that, especially when you mentioned your pulled meniscus. It sounds like things can get really ugly on the court. When players get pushed and shoved, does it count as a foul? Does it mean that the pushed player gets to take a free shot at the goal or are the rules very different from other sports involving fouls? Are there any rules that you think are pretty unique to floorball? Yeah well, I’ve seen worse, so I’m glad I didn’t have to be hospitalised or anything. One guy in the men’s league had his two front teeth knocked out and another dislocated his knee *shudders* BUT unfortunate accidents aside, I love playing floorball. It also is very exciting to watch because it’s so fast-paced. Rest assured that fouls like pushing and shoving do result in free hits against the offending team. This means that the ball is placed wherever the foul occurred, and the offending team must keep a distance of 3m (10ft) from the ball until the innocent team plays the ball. In the attacking half this usually means a shot on goal but the offending team is free to form a wall. As for unique rules, I can’t think of any. The aim is to score as many goals as possible to win. That’s pretty standard, I think. Haha. Ugh, that sounds nasty! I can only imagine how powerful the swings of the league-level players can be, and combined with the sticks, be really nasty! What are some of your favourite tactics and strategies in floorball? Do you have a go-to strategy that you love to play? You go, girl! Haha! So does your team have floorball camps or summertime events where you all just pack up and get away somewhere to practice or do some team-bonding? Or is it more of a “I’ll see you whenever we have practice” kind of thing? My club doesn’t do camps. Most players are graduates and have work to deal with, so there’s not a lot of time to spare. They do try to plan weekend getaways once a year but so far I’ve always been too busy to join them. Pre-season training and season span over nine months or more a year. That means weekends we either have a training session or a match. When season approaches and during season, we also train once or twice a week on weekday nights. Off-season, we might plan gatherings but a lot of players use that break to travel. Those whose workplaces are near each other do meet up for lunch or dinner though. Undergrads see each other on campus or during varsity trainings. The varsity team holds a training camp during the semester break in December to prepare for the varsity championships that are held from January to February. After that, the varsity team disbands during the second semester as most players focus on their own clubs to prepare for league. Oh yeah! The past two years the varsity teams did plan trips to Sweden and Finland for training camps since these two are the top floorball countries, so to speak. Sadly the university hardly subsidizes those trips, so those of us who can’t afford it don’t join. Either way, on average I probably see my teammates more than I see my regular friends, so I think I got to know most of my teammates well enough. On the plus side, one of my closest friends has been teammates with me since we both picked it up in 11th grade through to university, and also joined my club a year after I did. So yeah, having her around is definitely a bonus. Wow, trips to Sweden and Finland sound pretty sweet. It’s too bad that it isn’t paid for by the uni though. It’s good that your friend is in the club with you! What about your other friends? Do they show up at your games and become your personal cheering squad? Hmmm. One of my best friends used to play floorball, so we always were there for each other’s matches during inter-school championships because the guys’ and girls’ teams were allowed to support each other. In uni he stopped playing but he and my other two best friends always tried to be there for varsity championships whenever they could. As for league, I don’t think they’ve ever been to any of my matches. Besides them, I think the majority of my friends play floorball and/or hockey, or at least used to. So those who still play sometimes hang around to watch games before or after their own matches. If my match happens to be then, then they’ll support me but it’s rarely a planned decision to be there specifically for me. Those of my friends who don’t play anymore are preoccupied with other activities and don’t really bother. That’s pretty much the case for most players. School/ uni matches they’ve got support because of school spirit, etc but league matches, not really. Only during play-offs for the top four places are the stands more crowded. Ah, I see. School spirit definitely makes seats fill up faster. What would you say has been your most rewarding experience in floorball so far? What experience has made you think “Yes, this is my passion and I love it”? The most rewarding experiences came from beating teams stronger than mine. There’s a great sense of achievement whenever that happens and it lifts the team morale like nothing else does. As for an experience that made me think I love floorball, there’s not a particular moment, really. But I’ve gained wonderful friends through the sport, which is something I’m grateful for. I joined floorball almost by accident, so I often wonder how my life would’ve turned out without it. It would’ve turned out very differently. In fact, I might’ve met none of the friends that are dear to me today, be it floorballers or non-floorballers. That aside, floorball has always given me something to look forward to on dreadful days or during times I was down. That’s great, Joséphine! It’s so cool that you’ve found a sport to be passionate about. Do you have any tips for readers who might want to get started with floorball? Maybe some floorball websites and blogs that would be good for beginners? I think the best way to get started is to join a local team; be it in school or with a club. The International Floorball Federations lists member associations for all the countries that have an association. Contacting the relevant association will allow beginners to get in touch with a local team. The IFF website also offers resources and links. I especially like that they stream live matches once in a while. The past years all world cup matches were streamed live on the website (via YouTube). Speaking of YouTube, there are some good demos as well, where players can see how particular shots are supposed to be executed. A good place to start is Salming’s channel. The uploaded videos as part of the Salming Academy series. They’re splendid! Clear explanations are provided along with demonstrations. I also like Patrick Lönell’s channel. He only demonstrates but he has a wide variety of shots. Although, those are more useful for intermediate players. Either way, YouTube is good because videos can show things words alone can’t. Wow, that is a lot of links to help out the beginner floorball player! Thanks! Do you have any other passions besides floorball? I’d love to hear them before we end this interview. Actually I have a lot of interests. It’s just a matter of how much I time I have to dedicate to these activities. Besides sports, I also enjoy sewing, photography and baking. Well, and reading but that’s a given 🙂 I particularly love baking because food! How can anyone say no to that? It’s fun experimenting with ingredients and figuring out how to improve desserts. And nothing is fresher than homemade bread, so my parents are doubly supportive of my baking. I enjoy it so much that for years it’s been a recurring discussion in my family if I should pursue culinary arts but it never did come down to that. Even my friends constantly pester me to open my own bakery but for now, that’s not on the cards. Wow, that’s great! It’s so nice when your friends and family are so supportive of your passions. It just makes doing them so much more fun, especially if they do it with you, haha! So, now for the last question. Do you have anything to say before this interview ends? It’s all you! Tell us anything, plug your blog, favourite books, anything really. Well, if there’s one thing I’d like readers to remember at the end of my interview here, it’s dedication. Be open to trying new things but know that it takes dedication to become good at something. Too many people would like to be able to play an instrument or a sport but aren’t willing to put in the hours it takes to learn the necessary skills. Get up and do!, is all I can say. Thank you to Joséphine for sharing her love of floorball with us! Be sure to check out her blog for more awesome book loving! Just a note, dear readers. Whenever she mentioned an injury, I was really wincing in real life. I hope the medics are always prepared! Stay hydrated, all you sports-loving people! Thank you Ana, for hosting this series of interviews! 🙂 And don’t worry, medics are prepared to take care of competitors and to handle injuries. Floorball! This is totally new to me, and totally cool. I love the series idea too… interviewing bloggers about an important part of their life (other than blogging).